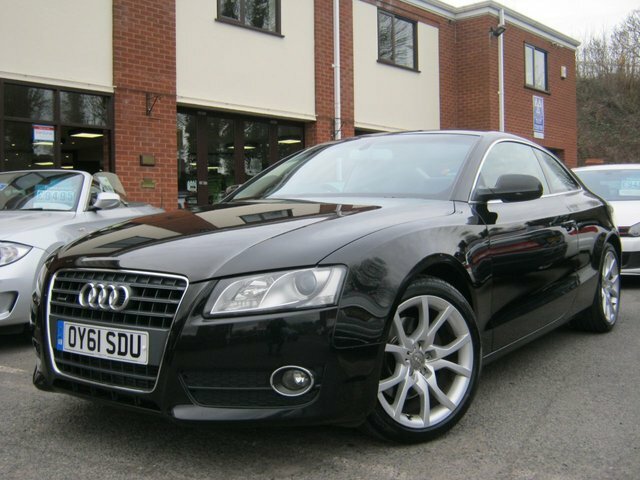 This lovely 2011 61-Reg Audi A5 2.0 TFSI Quattro Sport has to be the best you will find anywhere!! !it comes in Jet black with full black leather trim and comes fully loaded with extras! these include heated sports trim,factory satalite navigation and bluetooth phone pre,Xenon headlamps,cruise control,climate control,auto lights and wipers,reverse parking sensors and cd player,it comes supplied with excellent service history and was poreviously sold and maintained by us,first to see will buy without doubt!!!! From the flowing lines of the coupé to the open-top fun of the cabriolet, Audi's A5 range can delight and thrill with ease. The quality interior is typical of Audi and the A5's standard kit makes this model exceptionally easy to live with. Turn to a used A5 Sportback if you require the practicality of a five-door vehicle, or give in to the additional power and performance that's on offer with the S5 models. You'll find a great selection of used Audi A5 cars for sale in Worcester right here at BJH Motors and Sons. View our range online before contacting a member of the showroom team to discuss your requirements in more detail.